SIALKOT: She has no idea who Lionel Messi is and her home country isn't even playing, but Pakistani mother-of-five Gulshan Bibi can't wait for the World Cup -- because she helped make the balls. When Brazil and Croatia kick off the tournament in Sao Paolo on June 12 there's a good chance they'll be using a ball made by Gulshan and her colleagues at the Forward Sports factory in Pakistan's eastern town of Sialkot. "I'm really looking forward to the World Cup and inshallah (God willing) we will watch the matches. The balls we make will be used and all the women who work here are very proud," Gulshan told AFP. Cricket-mad Pakistan might not have much of a football team -- 159th in FIFA's world rankings -- but Sialkot has a long history of manufacturing top-class balls. Forward Sports has been working with Adidas since 1995 and supplies match balls to some of the world's top football competitions, including the Champions League, the German Bundesliga -- and now the World Cup. It is believed that a cobbler was once asked to repair a punctured ball for colonial-era British soldiers, later studying how to make them. So began a successful business venture that spawned an industry, but child labour scandals in the 1990s almost sank it. Now international brands like Adidas work closely with factories and NGOs to enforce stringent checks to prevent any return to the dark days of children stitching balls in dingy backrooms. At Forward Sports, workers must provide government ID to prove they are over 18. And while the basic 10,000-rupee ($100) monthly salary might put a $160 FIFA-approved "Brazuca" ball beyond the reach of the workers, several spoken to by AFP privately said the company looked after them well. In any case, assembling modern match balls is not simply a matter of sitting down with a needle and thread. The Forward Sports plant stands barely a free kick's distance from the dust and chaos of the Grand Trunk Road, the ancient highway that cuts across the subcontinent all the way to Kolkata. In contrast to the baking, deafening road outside where ancient goods trucks, donkey carts and motorbikes overloaded with families and livestock compete to avoid potholes, order and efficiency reign inside the factory. On the Brazuca production line, women in headscarves, some with their faces veiled, work briskly. They start with flat white propeller-shaped pieces of polyurethane, add the Brazuca's distinctive bright colours and glue the panels to the ball's rubber bladder. The seams are then treated with a special sealant and the ball is heated and compressed in a spherical clamp to give it the correct shape. The heat also activates the temperature-sensitive bonding compound that holds the ball securely together. The whole process from flat panels to finished item takes 40 minutes -- speed is crucial to prevent impurities getting into the ball -- and the factory can produce up to 100 per hour. It's a high-tech process for Pakistan, where much of the workforce is unskilled and poorly educated -- only around half the population can read and write. "We take unskilled workers and train them -- this is a job that is not available anywhere else. You have to get someone with good attitude and train them," said Forward Sports CEO Khawaja Masood Akhtar. Ninety percent of those working on the Brazuca were women -- unusual in Pakistan, where they are largely expected to stay at home with families, but Akhtar said they were more diligent and meticulous than their male colleagues. Making the Brazuca was no simple matter for Forward, as Adidas gave the order at short notice when they realised their main manufacturer in China was unable to meet demand. In just over a month, Forward managed to have the equipment it needed to make the Brazuca from scratch. "It was a matter of honour for us, we wanted to do it," Hassan Masood Khawaja, head of new product development, told AFP. Quality control is crucial, as the world's greatest football tournament and greatest players demand the best equipment. In the gleaming labs of Forward Sports, white-coated technicians put the Brazuca, 437 grams in weight and 69 centimetres in circumference, through a battery of tests on precision equipment brought from Germany. One machine rotates the ball while a curved arm tracks its surface, measuring 4,500 points and plotting its shape in 3D on a computer to ensure it is properly round. Other devices measure bounce, resistance to water and mould, even the glossiness of the ball's surface. The ball's durability is also rigorously tested. A special machine fires Brazucas at a flat metal plate -- they must survive 3,500 impacts at 50 kilometres (30 miles) an hour. 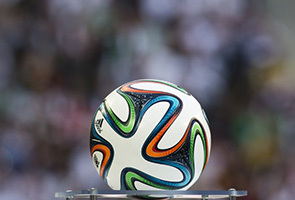 The Brazuca was designed after the controversy that dogged the Jabulani ball at South Africa 2010 -- slammed for its erratic, unpredictable flight. Scientists concluded the machine-made Jabulani was too smooth and too perfectly spherical to fly straight, with a tendency to slow suddenly in mid-air. Adidas spent two and a half years working on the new ball, testing it in 10 countries with 600 players from 30 teams including Messi, England's Steven Gerrard and Germany's Bastian Schweinsteiger. The deeper seams and textured surface of the Brazuca should disrupt the airflow over its surface, helping it fly more like a traditional 32-panel ball. Khawaja said the likes of Messi and Ronaldo should have no nasty surprises in Brazil. "We want this ball to be the same they are used to playing with in the Champions League, for instance -- they should not feel a difference," he said.